Greaves Cotton Ltd. is playing a catalyst for OEMs to address their regulatory and market requirements. Founded by James Greaves and George Cotton in 1859 and bought by the Thapar Group in 1947, turning it into an Indian entity, Greaves Cotton has been manufacturing diesel engines since 1939. Entering into a joint venture with Ruston & Hornsby Ltd., UK, the company introduced BSII compliant eco-friendly light diesel engines in 2005. Supporting automotive OEMs like Piaggio since its entry into India in 1998 by powering its three-wheelers with efficient diesel engines, and a range of small commercial four-wheelers that were launched at a later date, Greaves Cotton Ltd., is looking at playing a role of a catalyst by enabling OEMs to meet regulatory and other requirements successfully. To do so, the company has developed powertrain solutions that are BSVI compliant. It has engineered new powertrain solutions such that its clients – in the automotive space especially, will be able to address regulatory requirements like BSVI, and also the changing customer requirements for performance, efficiency and comfort. 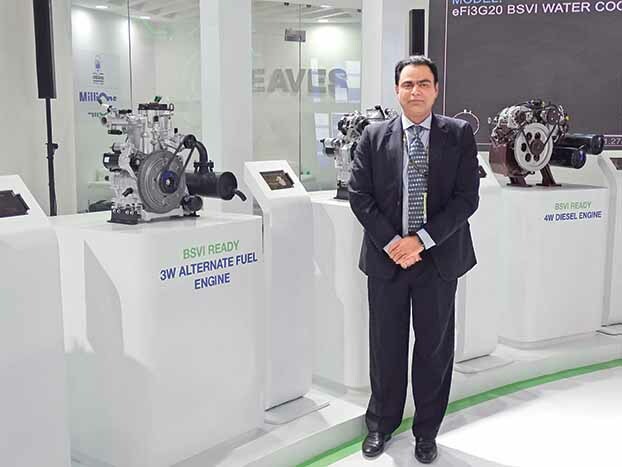 Engineered to help its clients to address the rising demand for alternate fuel powertrains, the new solutions that Greaves Cotton has developed will power three-wheelers and small four-wheelers of no less than 35 clients. Apart from Piaggio, Greaves Cotton supplies engines to Mahindra & Mahindra, Atul Auto, TVS, Tata Motors, and a range of regional three-wheeler manufacturers as well. 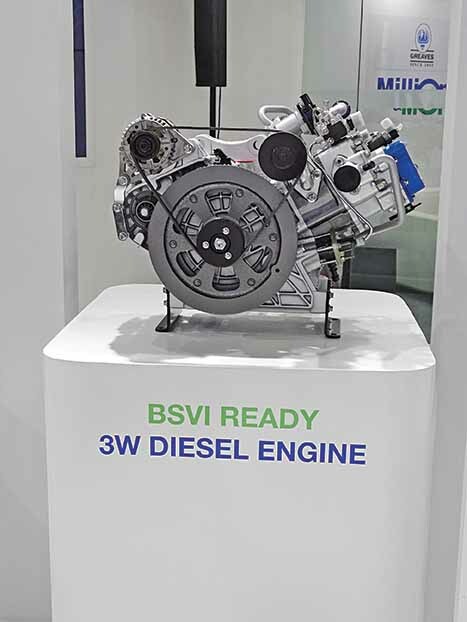 The current automotive powertrain range includes a range of single-cylinder diesel engines (6 kW BSIII/BSIV, 7.5 kW BSIII/BSIV and 8.8 kW BSIII/BSIV); a range of CNG and LPG engines (5.38 kW BSIII/BSIV, 6.7 kW BSIII/BSIV and 11 kW BSIV), and a range of two (33 to 54 hp unit pump common-rail BSIV), three (105 hp direct injection turbo intercooled BSIV) and four-cylinder (135 hp unit pump common rail BSIV) engines. Many of these engines are BSVI ready and form part of the new powertrain solutions development. A glimpse of this was had at the Auto Expo 2018. 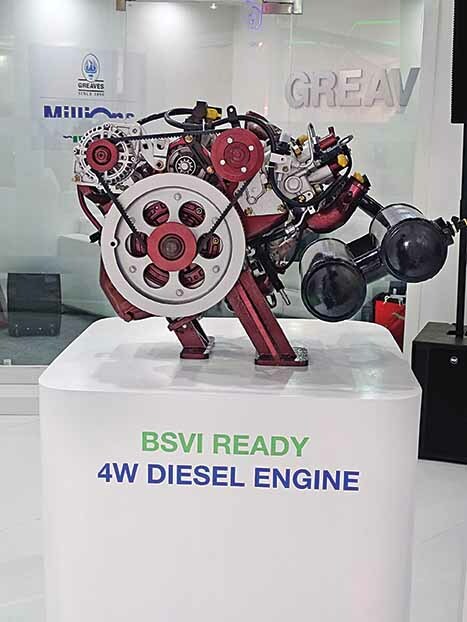 At its stall, Greaves Cotton showcased a BSVI compliant multi-cylinder turbocharged inter-cooled diesel and a CNG engine built in technical association with Pinnacle Engines and Altigreen Solutions. 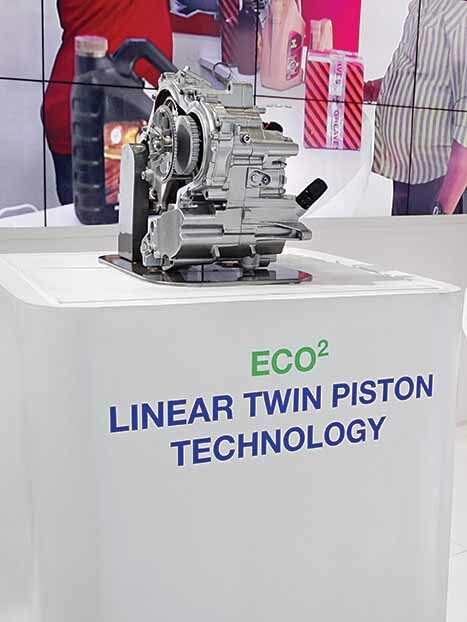 It also showcased a linear twin-piston technology for CNG and petrol three-wheeler engines that it has developed in partnership with Pinnacle Engines, USA. To support such new powertrain solutions, the company has developed an aftermarket program called ‘Greaves Care’. It will amount to India’s largest multi-brand organised service and spares network for three-wheelers and micro four-wheelers according to Nagesh Basavanhalli, Managing Director & CEO, Greaves Cotton Ltd.
Of the opinion that Greaves Cotton will re-invent last-mile mobility with the introduction of innovative engines and aftermarket solutions, Basavanhalli mentioned that their vision is to re-invent last-mile mobility with future-ready solutions that will provide consumers with efficient, technologically superior products and services. 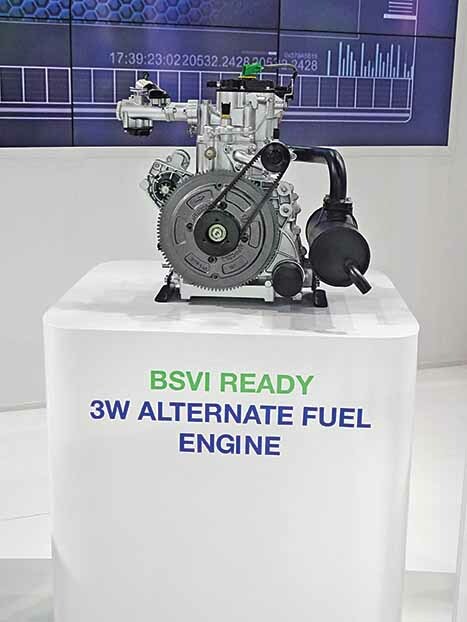 Upgrading most of its powertrain solutions to meet BSVI emission regulations, the company is banking on its association with Pinnacle Engines and Altigreen Solutions. Looking at it as a key to fulfil its vision of getting closer to the customer, Greaves Cotton is confident that the linear twin piston technology will lead to a big improvement in fuel efficiency and performance. It would also lead to a drastic cut in emissions. Claiming to have reworked the dynamics of participation as far as the CNG and petrol three-wheeler segments are concerned, the company, averred Basavanhalli, is looking at carving out a larger pie of the market. The technology, he quipped, gives us the confidence to enable our clients to offer a low total cost of ownership to their buyers. Equipping the Greaves Care scheme such that it will cover the changes taking place at the technology level, at the design and development level, and at the manufacturing level, Greaves Cotton has been cognisant of the fact that commodity inflation is on the rise. Recognising operational efficiency and product demand as the key drivers of growth, the company is seeking cost advantage. It has sold five million engines to date and is touching millions of people through its presence in the business. Clocking a 13 per cent increase in revenue at Rs.458 crores, in the first quarter of FY2018-19, in comparison to that of Rs.406 crores in the corresponding quarter of FY2017-18, Greaves Cotton has come to have a 3500 strong retail outlet network. Having six manufacturing plants and a strong workforce of over 3500 people, Greaves Cotton, building approximately 400,000 engines per year at its plants at Pune, Aurangabad and Ranipet, is watching several new initiatives that it has set in motion, and are transitioning to the next level. There are challenges much like there are opportunities. The most immediate challenge in the way of being a catalyst is the need to get its suppliers to move with it as the battle for BSVI intensifies. Nagesh Basavanhalli, MD and CEO, Greaves Cotton Ltd.
Q. What have been the growth drivers at Greaves Cotton? A. A key growth driver that we have been witnessing is stronger customer demand post the usual suspects of demonetisation and the rollout of GST in 2017. This has led us to have a strong strategic focus. We have laid down the roadmap for the next five years. It has led to a top-line growth. For bottom-line growth, we have been very cognizant of the fact that commodity inflation is on the rise. To counter it, we have been aggressive in terms of low-cost production and innovative techniques. Operational efficiency combined with the demand for our products have been the key drivers of our growth. Q. 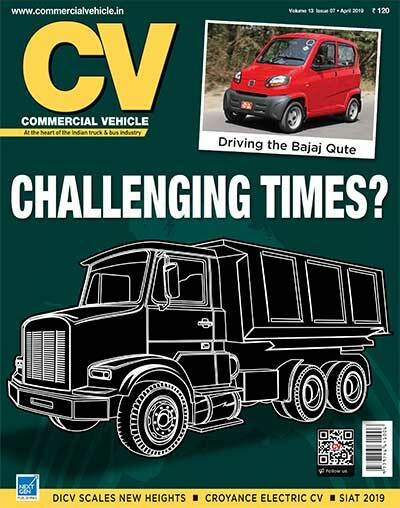 How do you look at the journey from diesel engines to a range of alternate fuel powertrains? A. We manufacture one engine every minute. Eight out of 10 diesel vehicles use a Greaves Cotton engine. We have sold five million engines till date. We offer 15 engine variants – from 4 hp to 700 hp. We are touching millions of people through our presence in the business of enhancing productivity. We have a 3500 strong retail network. Our scale is what provides us with the cost advantage. It is what makes it possible for us to offer our customers a lower total cost of ownership. It is this value proposition that we are backing up with a strategy to build fuel agnostic powertrains. Consumer preferences are changing. We are aligning our business in-line with these changes. We are increasing our capability by entering into technological alliances. We have entered into one with Pinnacle Engines for example. The new range of engines that we are building is based on green technology. These engines maintain a power to performance ratio while delivering a 30 plus per cent fuel economy. 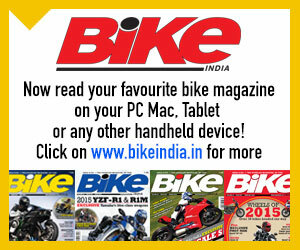 At times, it is not possible to incorporate all – power, fuel efficiency, etc. Our endeavour is to incorporate them all; to give the consumer what he wants. 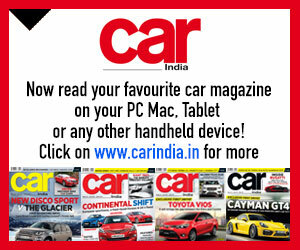 Consumer preferences are moving toward CNG, petrol, hybrid and electric. We are looking at the entire ecosystem. We are looking at a low cost, lightweight platform. Putting a battery on an existing platform, which is heavy would not lead to optimisation, and much like an electric vehicle powered by a coal-based energy source will not make an optimal solution. From a powertrain perspective, we are looking at a light-weighting of the body with our partners. By bringing in alternate powertrain solutions, we are providing end consumers with the desired value proposition. Q. 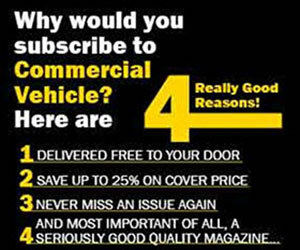 What are you doing to change the perception of being a three-wheeler powertrain provider? A. A majority of our customers are in the three-wheeler space. 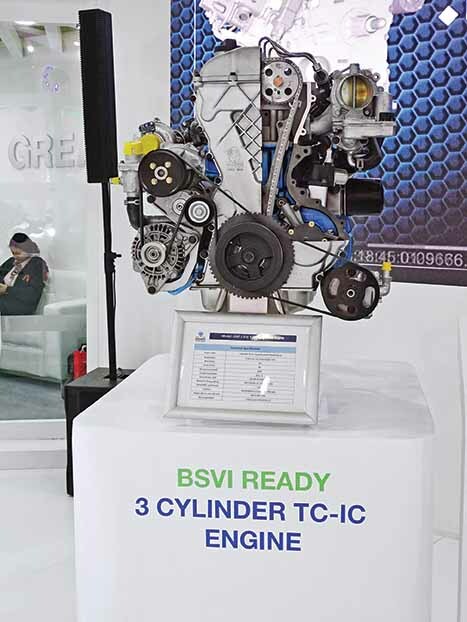 We are however also offering BSVI multi-cylinder engines to four-wheelers. We are talking to OEMs, and once they reach a certain level we will make a formal announcement. Q. What about your offerings in the hybrid and electric space? A. We have the solutions. It is necessary for us to gauge the market sentiment and get a feedback. On the basis of it, we will be able to fine-tune our strategy. It is necessary to work out the economics. Others are also certain to be working on this front. The need is for a supporting infrastructure like fast charging for example. Our announcement of Greaves Care is a step in the direction of creating an infrastructure. Q. How strong is your after-sales network? A. We embarked on a concept of multi-brand spares two years ago. It took our network one step ahead. It gave our channel partners an ability to strike a business in an environment that is largely unorganised. The environment tomorrow is going to be organised, and we will have a big advantage. We are building a strong multi-brand service network for three-wheelers thus. 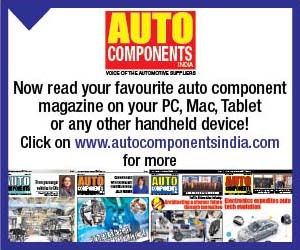 We have over 3500 plus spare parts and multi-brand parts, partners. We will scale up the network with the help of the right partners. Q. How are your partnerships with OEMs and allied partners working out? A. We are partnering with over 35 OEMs on the engine front. They have reinforced their faith in us not only for BSIV but for BSVI too. We will continue to support them; to offer them a value proposition that involves investing in technology and building our capabilities. We are bringing in a scale, a financial model, and technology partners with the knowledge that the time is short. Our strategy is to strike the right partnership as this would help reach the market faster. Q. How far do think EVs will come to dominate? A. EVs are progressing. Diesel, I feel, will move away from major cities to rural and semi-rural areas where access to diesel is easier. Over the short to medium term, CNG and petrol would continue. Over a period of time, hybrid and electric powertrains will start to take over. If one looks at markets like Europe, there are two million charging stations. Yet the per centage of ICE versus electric is such that the former outdoes the latter in per centage terms. We are also moving in the same direction. The shift will not be instant. It will take place over a period of time, and will be influenced by infrastructure and economics. Q. What is your R&D setup like? A. At Greaves Cotton, we have a highly skilled team. It is well versed with different technologies. It provides us with a distinct advantage. We also are working closely with our partners. Q. How do you look at the opportunities and challenges? 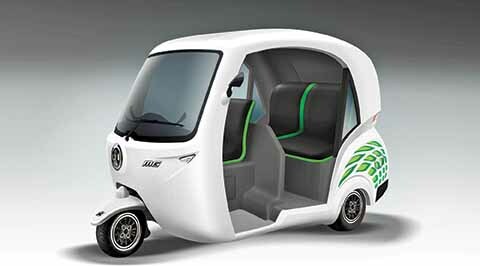 A. Three-wheeler demand is picking up. The engine business is picking up. The agriculture business that we are in, is also picking up. Not just these two, the genset business that we are in, is also growing. It is clocking double-digit growth for us. The trend is likely to continue. In the aftermarket business, we are also seeing strong traction. We are driving several new initiatives. Each is transitioning to the next level. The key challenge that we see is about the ecosystem; about our suppliers getting ready and setting up the infrastructure to meet BSVI, and well before BSVI is implemented.